With online matrimonial sites & online dating becoming common news, there has been an increase in the frauds & cases of innocent people being taken for a ride. 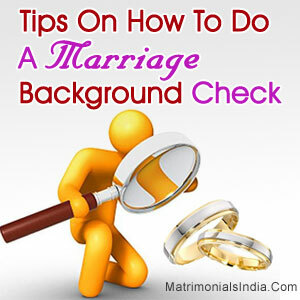 So it has become very important for a person to conduct a proper Marriage Background Check before getting into a serious relationship or marrying someone. With a proper Marriage Background Check, you can get to know whether a person is married to someone presently or whether they were married in the past. Find Out The Proper & Full Name Of The Person On Whom You Want To Conduct A Marriage Background Check : This is important because all the official records or state records (whether birth certificate, marriage certificate, and criminal records) contain the proper name of an individual. Other Than Online Search, You Can Even Visit State Offices : For this, you need to know the state or place to which the person belongs (on whom you want to conduct a Marriage Background Check). Once you get this information, you can visit the local courts or the public records office & conduct inquiries about the person. This will usually take some time & effort, but this is a reliable way to get Background details about a person. You Can Even Hire A Good Private Investigator For The Job : For people who have money, they can also hire a reputed Private Investigator for conducting a reliable Marriage Background Check. But before hiring make sure that your budget can handle the strain as Good Private Investigators can be pricey. Since Marriage is a big deal, before making this commitment it makes sense to be sure about the person with whom you are going to tie the knot. Doing a Marriage Background Check will eliminate any chances of a deception & will also ensure that your trust in the other person is not misplaced.